Chew Design recently created an identity for the topical website www.macaronikid.com. Working for Jump Media in New York created many interesting ideas and output. Communication at such a distance might be deemed a problem but not in this internet age we all live in. The collaboration was such a success that Chew design have continued the working partnership beyond the logo and branding. “Jump was looking for an agency that would deliver fast quality output consistently”, Paul from Chew states. “They seen that consistency right from the start and have stayed the course since then continually coming back to us with more work and requirements along the way”. The project was deemed so successful that Paul recently completed an advert campaign in print aimed at the website’s main users, largely hockey moms. The advert is currently running throughout the United States and the website becomes ever popular. 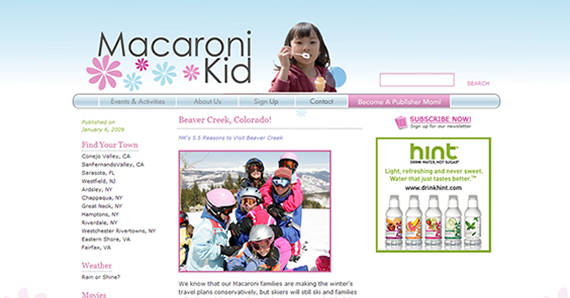 Macaroni Kid and its family of Publisher Moms are dedicated to delivering the scoop on all the family-friendly events and activities happening in their communities each week. Nicki Hemby, a principal with Macaroni Kid explains the beginnings of a website aimed at spreading the word on events in and around New York. “It all started with two old friends sharing a good meal and a great bottle of wine. After catching up on work and children, Joyce mentioned an idea she had to publish a weekly newsletter for moms. Now, you must know that Joyce and I have a Lucy and Ethel relationship: She comes up with these harebrained ideas, and I back her up to the best of my abilities. But as I sat and listened, I thought, this is her best work yet! A weekly newsletter giving moms and dads the scoop on all the weekly events in our community? We began publishing Hampton.MacaroniKid.com in May 2008. We feature events, shows and family hot spots on the newsletter. We email the newsletter to thousands of moms and dads each Thursday and then post the entire issue to the website. And Macaroni Kid was born.